Standing alone or brought together, these owls can be dressed up for any occasion. 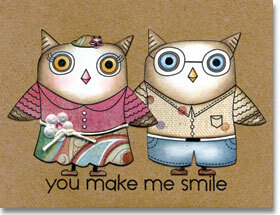 Stamp the Boy and Girl Owl images on white cardstock. Color the faces, wings and feet with pencils. Cut out. Stamp the owls again on pattern papers and trim out the clothes. Add the clothing to the owls and affix to a Kraft Notecard. Stamp the “you make me smile” greeting from the Caption Messages set under the owls. Add a Sparkle Gem Small Blossom to the girl owl’s hat to finish. Use different pattern papers to create a variety of cool owl clothing.